SAN JOSE — The Japanese American Museum of San Jose, 535 N. 5th St. in Japantown, will present its Nisei Soldiers Film series on two weekends this month. Saturday, July 20, at 1 p.m.
• “A Flicker in Eternity” is the coming-of-age tale of Stanley Hayami, a talented young man caught between his dream of becoming a writer/artist and duty to his country. Based on Hayami’s own diary and letters, which are archived at the Japanese American National Museum in Los Angeles, and Joanne Oppenheim’s book “Stanley Hayami, Nisei Son,” this documentary is the first-hand account of a teenager thrust into the turmoil of World War II and is a poignant reminder of the indignity of incarceration and the tragedy of war. Through Hayami’s endearing cartoons and witty observations, this film chronicles his life behind barbed wire and as a soldier in the 442nd Regimental Combat Team. Filmmaker Ann Kaneko will speak after the screening. • “Honor & Sacrifice” is the story of one man’s journey from early hardship to a concentration camp and ultimately to the stature of authentic American hero. This story is based on Roy Matsumoto’s contribution as a member of Merrill’s Marauders. He was a man of extraordinary strength, stamina, wit, and courage, as this story demonstrates. 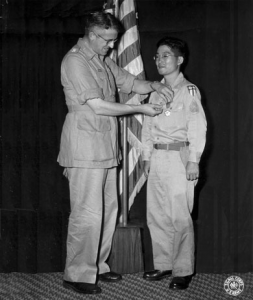 But in most respects he was also a typical member of the Japanese American community he grew up in, showing the qualities of determination, loyalty, and acceptance of sacrifice throughout his life and military service years. These same qualities define the place in U.S. history occupied by Japanese Americans of the 20th century. Nisei veterans Lawson Sakai and Kats Hikido of the 442nd Regimental Combat Team will speak after the screening. The filmmakers are raising funds for outreach and distribution. Tax-deductible donations can be made to their non-profit fiscal sponsor, the Bainbridge Island Japanese American Community, at www.bijac.org. Sunday, July 28, at 1 p.m.
• “MIS: Human Secret Weapon” explores an untold chapter in Japanese American history and encourages the audience to think about the values of peace. It describes how the Military Intelligence Service contributed to America’s victory and to Japan’s recovery after World War II ended. This film is the final installment of Junichi Suzuki’s trilogy centered on the Japanese American experience during the war, following “Toyo’s Camera” (2008) and “442: Live with Honor, Die with Dignity” (2010). Cost: Free with admission to the museum (non-members, $5; students and seniors over age 65, $3; JAMsj members and children under 12, free). To reserve a spot, email [email protected] or call (408) 294-3138. For more information, visit www.jamsj.org.